Revisiting ground covered previously in his superb Citizen Soldiers (1997) and other works about the climactic European campaigns of 1944—45, distinguished historian Ambrose (Undaunted Courage, 1996, etc.) tells the story of the conquest of Nazism by an array of American, English, and Canadian kids led by the plain-spoken Dwight Eisenhower. As in his earlier works, Ambrose focuses on the stories of individuals—the men who planned and led the invasion, the junior officers and non-commissioned officers, and the ordinary citizen soldiers of the Allied armies. He traces the training of ordinary boys from Chicago, Kansas, and Georgia, and the rise of their commander, Dwight Eisenhower, through a variety of staff posts. “Ike,” as he was known to absolutely everybody soon after his arrival in England in 1942, quickly became a favorite with the British press and with the often prickly English military establishment: He relied often on his considerable diplomatic skills to compel the British and American commanders to work together. However, the author faults the inefficiency of Ike’s war of attrition and his failure to ensure that his army was adequately trained and equipped for battle. Most of the narrative is devoted to the travails of the individual soldier in combat. 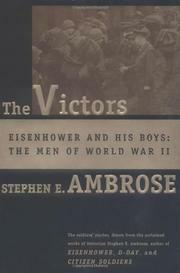 With photographic immediacy, Ambrose shows the pitilessly savage nature of the war as he takes the reader through hellish beach landings, sanguinary battles to liberate Normandy, pursuit through France, the terrifying aspects of trench, street, and night battle, setbacks to the Allied advance, and the ferocious but ultimately unsuccessful German counter-punch through the Ardennes. Meticulously researched and characteristically well told. A compelling and heartfelt tribute to the GI.